Savitry Greens: - In Close proximity to Chandigarh and Panchkula, Zirakpur is a fast developing locale near the verdant slopes of the Himalayas. 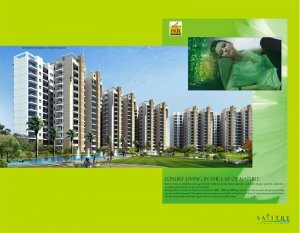 Savitry Greens will be located on VIP Road, abutting Ambala-Zirakpur highway. Around it are a number of residential projects that are either ready or in advanced stages of construction. That means, residents get the best of community living and the best of connectivity in one exotic blend. Savitry Greens is within walking distance of the local Shopping complex, Wall Mart(best price), Paras Downtown Mall, Bristol Hotel & Resort and an upcoming 5Star Hotel. Reach out, and the world is within reach! Rising within a stretch of 22acres in Towers of 2/3/4 BHK apartments of various Sizes, The group housing layout is well landscaped. The Apartments are spacious and offer total Privacy. A host of smart features and facilities like elevators and power back-up provide convenience to daily living. There we are provide you Some Different Facilities like Water, Car-Parking, Club, Gym, Swimming Pool, Kids Swimming Pool, Lazy River, Water- fountain, Pool deck, Pavilion, Shops, Kids play Area, Stream, Central lawn, Jogging track, Party Lawn ETC….